Please see the FAQ section and feel free to send any comments here . It's recommended to download randomly named EXE (click button above) because some malware won't let gmer.exe launch. - Added new option "gmer.exe -nodriver"
- Added new option "gmer.exe -killfile"
- Improved "GMER Safe Mode"
- Added "GMER Safe Mode"
- Improved hidden services scanning. - Improved "Kill all" and "Restart". - Added hidden services scanning. - Added hidden services deletion. - Added hidden files deletion. - Added restoring SSDT table. - Added Interpretation of the rootkit scanning. - Fixed tracing library loading. - Improved hidden files scanning. - Fixed hidden registry keys scanning. - Added online antivirus scanning. - Added loading devices monitoring. - Added "Kill all" function. New version 2.0.18327 with full x64 support has been released. New version 1.0.15.15565 has been released. New version 1.0.15.15530 has been released. New version 1.0.15.14878 has been released. ALWIL Software has released AVAST 4.8 containing anti-rootkit based on GMER technology. Stealth MBR rootkt found in the wild ! "... Around the middle of February 2007, CastleCops itself became the target of a large scale DDoS. Not new to this kind of attack, it is the first time CastleCops experienced such a large throughput at nearly 1Gbit/s ..."
Andy Manchesta added catchme into SDFix tool. Thanks to Marco Giuliani for preparing Italian version of help ! New version of catchme with Windows Vista support released. Catchme has been integrated with combofix developed by sUBs. Keep up the good fight sUBs !. After over a month of fight my web page is up and running. Thank you Paul Vixie and ISC, Matt Jonkman, guys from register.com, MR Team and everyone who helped me. Special thanks to Paul Laudanski who won this battle. My doman DDoS-ed for the first time. Rootkit doesn't create hooks ( SSDT, IRP, SYSENTER, IDT, inline, FSF ) and its modifications are not visible. You can see it in action in these movies: test.wmv, test2.wmv ( 0.9MB, 0.7MB Windows Media Video 9 codec ). The detection of this type of rootkit will be added into the next version. New tool - catchme released. Question: Do I have a rootkit? Answer: You can scan the system for rootkits using GMER. Run gmer.exe, select Rootkit tab and click the "Scan" button. If you don't know how to interpret the output, please Save the log and send it to my email address. Warning ! Please, do not select the "Show all" checkbox during the scan. Question: How to create "3rd party" log ? Answer: Tick "3rd party" option and then click the "Scan" button. After the scan you can use "Remove signed" and "Remove duplicates" options to filter the scan results. Question: How to install the GMER software ? Answer: Just run gmer.exe. All required files will be copied to the system during the first lanuch. Question: How to uninstall/remove the GMER software from my machine ? Answer: Just delete the exe file. Answer: Try to rename gmer.exe to iexplore.exe and then run it. Question: How do I remove the Rustock rootkit ? Answer: When GMER detects hidden service click "Delete the service" and answer YES to all questions. Question: How do I show all NTFS Streams ? Answer: On the "Rootkit Tab" select only: Files + ADS + Show all options and then click the Scan button. Question: Can I launch GMER in Safe Mode ? 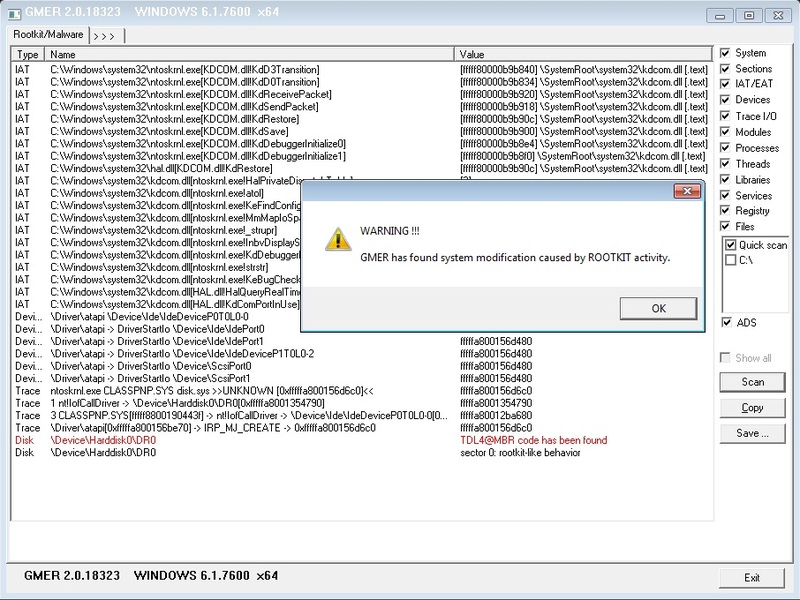 Answer: Yes, you can launch GMER in Safe Mode, however rootkits which don't work in Safe Mode won't be detected. Question: I am confused as to use delete or disable the hidden "service". Answer: Sometimes "delete the service" option wont work because the rootkit protects its service. So, in such case use: 1) "disable the service", 2) reboot your machine, and 3) "delete the service".